Trump ran up against his own words when he issued the first travel ban, which cried out for injunctive relief because of who issued it, not because of what was issued. Here, then, is the person overruling his own interests. It's -- what would you call it? -- Trumpian. Here's his Hugeness hugely blowing it. How long will his own words haunt him? Indeed, it's Trump's own words that follow him around, most especially on the pair of travel bans that haven't passed muster with the courts. He may still win, especially in the Supreme Court, but so far his words are trampling on his hoped-for deeds. But also there is a third possibility, and we should be candid about it: Perhaps everything Blackman and Margulies and Bybee are saying [in their dissents against injunctions of the travel bans] is right as a matter of law in the regular order, but there’s an unexpressed legal principle functionally at work here: That President Trump is a crazy person whose oath of office large numbers of judges simply don’t trust and to whom, therefore, a whole lot of normal rules of judicial conduct do not apply. Barack Obama would have been afforded that deference. 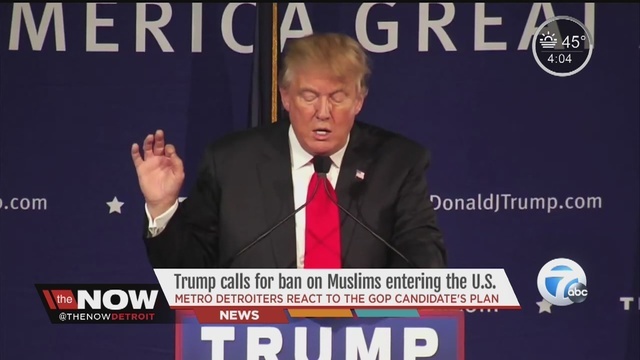 Donald Trump, due to his clear statements wanting to ban Muslims from entering the country, can hardly expect the same deference. And were a court or a judge to wonder how to decide, Trump, because of his numerous statements on the subject, has no doubt illustrated that his travel ban(s) utterly fail a Lemon test. Those who want Trump to prevail in these disputes state plainly that the law does not allow a policy to be set aside simply because one president is different from another. But anyone who looks at Donald Trump can't help but notice that he's not like other presidents. In many ways, he's thrown the office of the presidency into a kind of chaos by his clearly demonstrated untrustworthiness. His lack of veracity calls into question his actual adherence to his oath of office. In the end,Trump's faithful adherence to the so-called Take Care clause -- to actually follow the law -- cannot be relied on. Judges trust Trump at their peril. Oh, what a new normal that is.